The Height Adjustable Shower Chair assists in sitting or standing and makes personal hygiene easier while taking a shower. Dimensions between arms: 17 1/2"
Lightweight. Safe. Functional. Sturdy. Easy To Install. Lightweight. Functional. Sturdy. Easy To Install. Safe. This chair worked out well for me. When I was in the hospital, they recommended a tub bench--took up the whole bathroom! This chair fits nicely inside the tub, it is lightweight and easy for me to move. 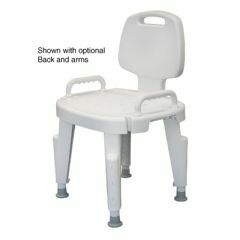 Allows me to stand and sit with some support, does not skid (I have it on a bath mat and the suction cups stick to that.) I recommend, but only if you have the ability to stand without much support. Like the size of it! Legs impossible to adjust. Not sturdy when seated. Would not recommend this . This was easy to assemble except for the leg adjustment which was near impossible. Only one leg actually fit into the grooves properly. The plastic pieces were not constructed properly when it was made. I would recommend a product with metal legs, not plastic. How much does the bath chair supporting 300# weigh? I share a bath with other members of my family and chair has to be removed after each use. There are no dimensions given. I need to know them before ordering. is there a weight restriction and how many kilo's would be the limit? Think it was 300 lbs or about 136 kilos. Can't find the booklet right now. wHAT IS THE WIDTH AND DEPTH?????????? what is the depth and width of legs? what are the dimensions of the chair? Are the rubber cups on the legs removable?? can you order just the back for a replacement? Are the arms removable? I don't know which direction I'll need to slip onto the seat. Back and arms are removable according to text.